Looking for a Used Grand Cherokee in your area? CarGurus has 82,841 nationwide Grand Cherokee listings starting at $900. The Jeep Grand Cherokee midsize SUV receives a complete makeover for 2011, which includes a restyled exterior, a more powerful V6 powerplant, improved fuel economy, a new suspension, and an upgraded interior, as well as new optional off-roading features. A few of the 2011 Grand Cherokee's new high-tech features remain a little rough around the edges, prompting owners to report problems with on-board computers and software. The 2011 Jeep Grand Cherokee generally gets stellar marks for its overall design, powerplant, suspension, safety features, and interior. Many owners also find the Grand Cherokee a good value when compared to the competition. However, some owners have reported minor glitches with the Grand Cherokee's many new high-tech communications and safety systems, which the automaker sometimes finds difficult to resolve. Building on its nearly 20-year history as a supremely confident off-roader as well as a relatively upscale around-town family hauler, the Jeep Grand Cherokee midsize SUV receives a full makeover for 2011, taking its off-roading capabilities, powerplant, suspension, and interior appointments into new territory. Owners will also find the 2011 Grand Cherokee roomier and more cargo-friendly than the previous year's version, thanks to its longer wheelbase and overall length. Jeep stretched the Grand Cherokee's wheelbase by 5.3 inches, to 114.8 inches, while overall length increases by a more modest 1.8 inches, to 189.8 inches. As a result, rear-seat legroom increases by 4 inches and cargo capacity increases by 17 percent, to 35.1 cubic feet. The longer wheelbase also improves the Grand Cherokee's ride, according to owners and reviewers. Outside, Jeep has smoothed out the Grand Cherokee's rougher edges, giving the SUV a streamlined, more aerodynamic look, with recessed panels on the doors, a low bodyline, and a raked-back roofline. However, the 2011 Grand Cherokee retains its more aggressive and masculine styling cues, including flared trapezoidal wheel arches, as well as the familiar seven-slot grille, which clearly mark the Grand Cherokee as a Jeep. Bright chrome molding gives the side windows a more distinguished appearance, while soundproofing in the wheel wells and undercarriage ensures a quiet ride. Jeep offers the Grand Cherokee in Laredo, Limited, and Overland trims, all available as either rear-wheel-drive or four-wheel-drive (4WD) vehicles. All come equipped with a world-class interior highlighted by premium soft-touch interior materials for all models. Upper-end trims include such amenities as wood-grain trim and heated second-row seats. A new 3.6-liter Pentastar V6 engine provides base power for all 2011 Grand Cherokee trims. The new DOHC V6, designed for both performance and fuel efficiency, features variable valve timing and generates 280 hp, an improvement of 70 hp, or 38 percent, over the previous year's base powerplant. Torque also receives a bump to 260 lb-ft, an 11 percent improvement. As a result, the engine provides a responsive driving experience around town. The engine mates to a five-speed automatic transmission. 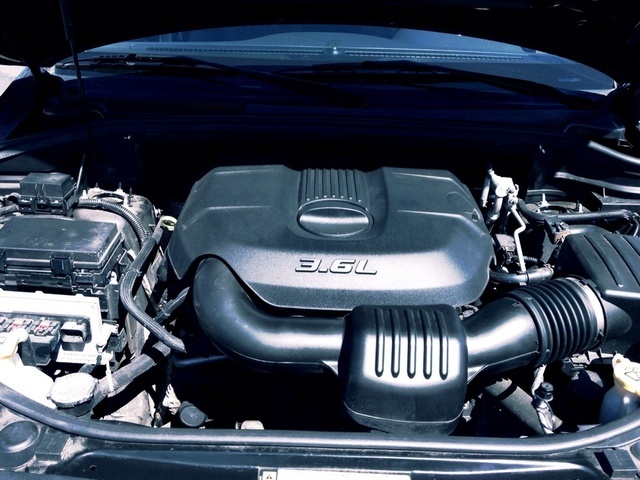 The FlexFuel-capable V6 runs on both regular unleaded gasoline and E85 fuel. Designed to be more fuel-efficient than previous engines, it manages a fairly respectable 16/23 mpg in rear-wheel-drive trims and 16/22 in 4WD trims. Fuel economy numbers at highway speeds are 11 percent better than the previous year's mileage, according to the automaker. With the improvement in fuel economy, the Grand Cherokee now travels more than 500 miles on a single tank of gas. Owners who require more power can opt for an available 5.7-liter V8, which churns out a class-leading 360 hp and 390 lb-ft of torque. When equipped with the V8, the Grand Cherokee can tow up to 7,400 pounds, as opposed to the 3,500-pound capacity of the V6. The V8 posts fuel economy numbers of 14/20 mpg. Jeep offers three different 4WD systems for the revamped Grand Cherokee. The Laredo 4WD trim comes equipped with full-time Quadra-Trac I, which features a single-speed transfer case and a new traction control system. The Limited and Overland both receive the full-time Quadra-Trac II, which includes a two-speed transfer case and the new Selec-Terrain traction control system. The Overland with the V8 engine gets the Quadra-Drive II system, which provides a full-time transfer case and electronic limited-slip differentials on both axles, as well as low-range and neutral modes. The new Grand Cherokee rides on a Mercedes-inspired platform, a benefit of the one-time Chrysler/Daimler partnership. The front independent and rear multilink suspension provides a smoother, more comfortable ride than the previous configuration, while power rack-and-pinion steering ensures capable handling. However, some reviewers report limited feedback from the steering system, which can make the driver feel too insulated from the road. The brakes similarly provide good stopping power, although they don't communicate enough feel for some drivers. 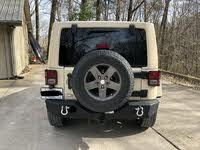 For 2011, Jeep introduces the new Quadra-Lift Air Suspension system, which comes standard on the Overland 4WD trim and is available as an option on the Laredo and Limited 4WD trims as part of the Off-Road Adventure Group II package. On trims equipped with the Quadra-Lift system, drivers can easily raise the vehicle's height by up to 4.1 inches, to a maximum ground clearance of 10.7 inches, by simply turning the height adjuster knob located on the dashboard. The new Quadra-Lift system offers five different settings for all types of road conditions and terrain, including Off-Road 2 (which raises the suspension by 2.6 inches), Off-Road 1 (raises by 1.3 inches), Normal Ride Height, Aero Mode (lowers by 0.5 inches for better aerodynamics), and Park Mode (lowers by 1.5 inches for easier boarding and exiting). In addition, Jeep's new Selec-Terrain system, which also comes standard in the Overland 4WD and is optional on the other two 4WD trims, ensures optimal traction on all types of road surfaces and terrain. Selec-Terrain offers five driver-selectable settings, which electronically control the powertrain, brakes, suspension, throttle, transmission, and transfer case, as well as the traction control, Hill Start Assist, Hill Descent Control, and electronic stability control systems. In Auto mode, the system automatically adapts to any on- or off-road situation, while the Sand/Mud and Snow settings make adjustments for specific types of road surfaces. The Sport setting enhances on-road capability, while the Rock setting utilizes the Quadra-Lift system to raise the vehicle to its maximum height for serious off-roading. The Laredo trims ride on 17-inch aluminum wheels, while the Limited trims get 18-inch aluminum trims. The Overland trims rule the roost with their big 20-inch aluminum wheels. Not only longer but wider by 3 inches than the previous generation, the 2011 Grand Cherokee keeps passengers comfortable with its roomy, well-equipped cabin. Passengers will find premium soft-touch interior materials in all trims, as well as increased rear-seat knee room and more legroom throughout. Occupying the entry-level spot, the Laredo trim comes equipped with such niceties as a leather-wrapped steering wheel with audio controls, an 8-way power-adjustable driver's seat with 4-way lumbar adjustment, leather-trimmed door and center armrests, and a six-speaker Media Center AM/FM/CD/MP3 audio system with Sirius satellite radio and UConnect voice command capability. Other standard features include a front passenger fold-flat seat, dual-zone air-conditioning with air filtering, cruise control, remote keyless entry, and illuminated cupholders. The mid-level Limited adds front and second-row heated leather seats, memory settings, automatic temperature control, and an Alpine premium nine-speaker audio system with a 506-watt amplifier and a subwoofer. The Limited also comes equipped with a new standard feature, the CommandView panoramic dual-pane power sunroof, which includes a one-touch express-opening vent. The Overland trim adds premium Nappa leather upholstery, vented front seats, a wood-and-leather heated steering wheel with memory, wood bezels, a leather-stitched instrument panel, and a power rear liftgate. The base UConnect voice command system, which comes standard in all trims, interconnects with the audio system, enabling drivers and passengers to quickly locate their favorite music and radio stations. An optional upgraded version provides voice-command access to an included navigation system. With the upgraded system, passengers can also make hand's-free cell-phone calls and access the Web. Thanks to more than 45 safety and security features, either standard or available as options, the 2011 Jeep Grand Cherokee earned a Good safety rating, the highest available, as well as a Top Safety Pick designation from the IIHS. New optional accident-avoidance systems, available in the Limited and Overland trims, include Forward Collision Warning, Adaptive Cruise Control, Blind Spot Monitoring, and Rear Cross-Path Detection. The Forward Collision Warning system uses radar sensors to detect vehicles approaching one another too rapidly, and alerts the driver with an audible chime when it detects a situation that demands the driver's attention. The Blind Spot Monitoring system similarly uses sensors to alert drivers of encroaching vehicles, while the Rear Cross-Path Detection alerts drivers of an approaching cross-traffic vehicle when backing up. All Grand Cherokees come equipped with such safety features as full-length side-curtain and seat-mounted side thorax airbags, active head restraints, antilock brakes, electronic stability control, electronic roll mitigation, Hill-start Assist, and Trailer-sway Control. Overall, the Grand Cherokee generates positive reviews from owners. Its many attributes, according to owners, include the Grand Cherokee's fuel economy, handling, ride, and comfort. However, some owners report minor problems with the Grand Cherokee's many new high-tech features, including the SelecTerrain system, which does not remember settings when the vehicle is turned off, and the remote keyless entry system, which needed a software update, according to one owner. Other owners report some glitches with the vehicle's computer systems. The large, comfortable, and quiet cabin gets thumbs' up from owners. In addition, most owners consider the Grand Cherokee a good value, especially when compared to competitors such as the Nissan Murano, and would recommend the vehicle to a friend. What's your take on the 2011 Jeep Grand Cherokee? 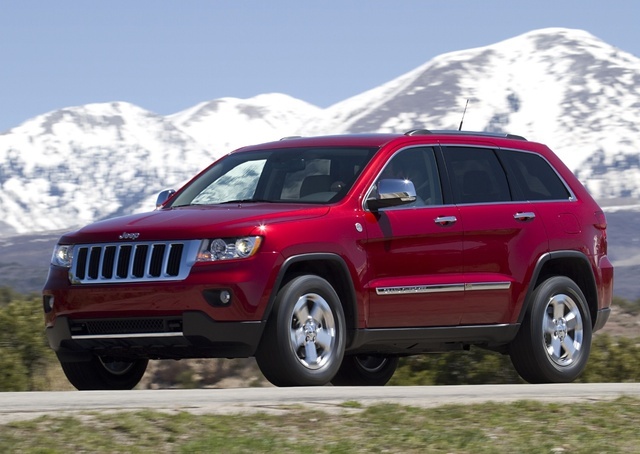 Users ranked 2011 Jeep Grand Cherokee against other cars which they drove/owned. Each ranking was based on 9 categories. Here is the summary of top rankings. 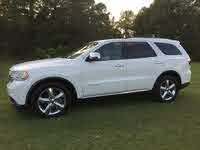 Have you driven a 2011 Jeep Grand Cherokee? 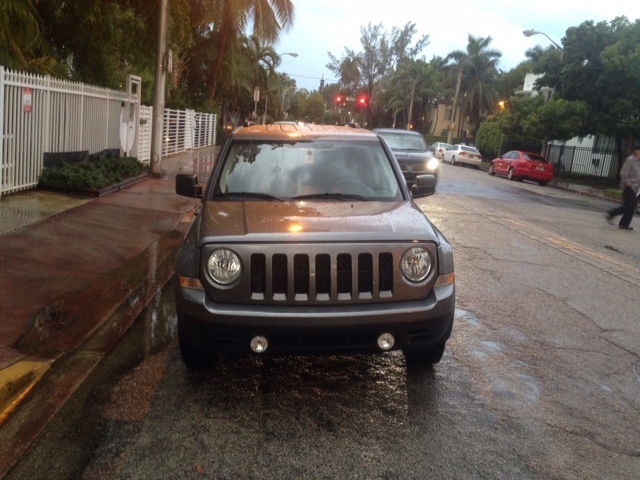 Would the hood from a 2018 Jeep Grand Cherokee track hawk fit on a 2011 Jeep Grand Cherokee Laredo?